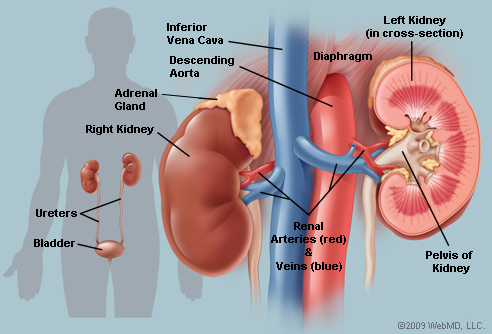 External and internal structure of the kidney; parts of the excretory system along with the blood vessels entering and leaving it should be taught with the help of charts or models. Students should be able to draw the diagrams with correct labelling and know the functions of various parts. A general idea of the structure of a kidney tubule nephron should be given. A brief idea of ultra filtration, selective reabsorption and tubular secretion in relation to the composition of blood plasma and urine formed. Why do we urinate more frequently in winters? Our body has different methods of releasing liquids- by perspiration and by urination. When the temperature is warmer we perspire more, hence frequency of urination is less. In cold winter months we perspire less, hence urinate more frequently. 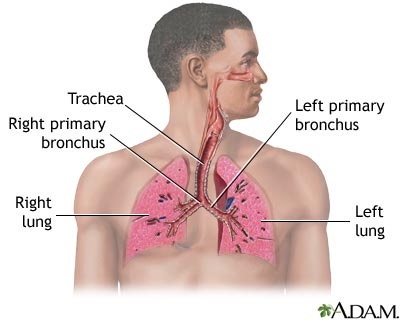 This is a part of maintaining homeostasis in the body. 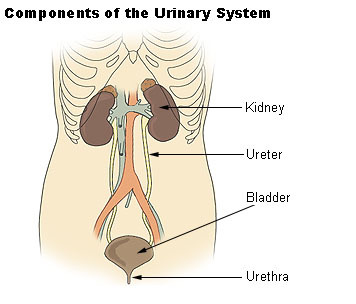 Urine is produced by the kidney, that is a part of the excretory system. There are many metabolic reactions taking place in the body, these biochemical reactions produce useful substances as well as certain toxic substances. This can also cause a change in the body water content. 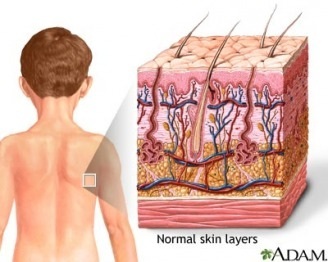 It is essential to remove these toxic substances and maintain the water level of the body. The removal of these toxic metabolic waste is called excretion. Waste products are in the form of carbon-di-oxide from respiration, bile pigment from breakdown of hemoglobin and the main form of waste is from the breakdown of excess amino acids. These can be in the form of ammonia, urea or uric acid. These are released out of the body in the urine. Some living beings waste in the form of ammonia. These organisms are known as ammoniotelic. Examples- Sponges, coelenterates and bony fishes. Some living organisms release waste in the form of uric acid. uric acid is least toxic. These organisms are called uricotelic. Examples- insects, reptiles and birds. Some living organisms release waste in the form of urea. Urea is neutral and less toxic. These organisms are called ureotelic. In the abdominal cavity below the stomach, on either side of the vertebral column. 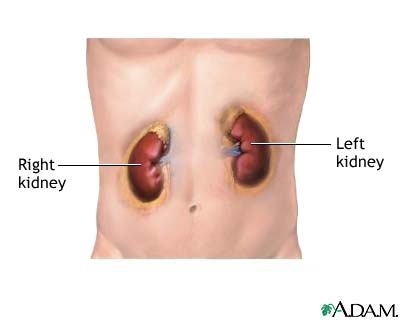 The right kidney is placed slightly lower than the left kidney as it is pushed down by the large right liver lobe. 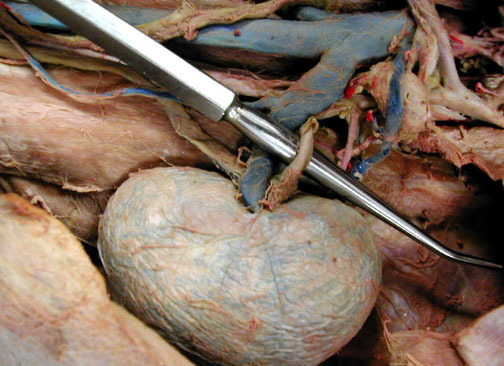 The descending aorta branches to form the renal artery that enters the kidney, and the renal vein comes out of the kidney to join the inferior vena cava. Kidneys are bean shaped structures about 10 cm long. The outer side is convex and the inner margin is concave. In the middle of the concave side a notch is present through which structures enter and leave the kidney. This is called Hilum. Cortex- Outer dark region has a dotted appearance. Medulla- Pale inner region has pyramid like structures . The pyramids open into small tube like structures the minor calyc and two or three minor calyc opens into the a major calyc. The all the major calyces opens into the pelvis. The pelvis is the proximal end of the ureter that receives the urine from the calyces. The renal artery carries blood with waste products inside the kidney. This blood is carried to structures that filter the blood, these structures are called nephrons. The filtered blood then leaves the kidney through the renal vein. The blood in the renal artery carries unfiltered and oxygenated blood. The blood in the renal vein carries filtered and deoxygenated blood. The main waste product excreted is urea. The urea is produced in the liver. Each kidney is made up of microscopic, coiled tube like units called nephrons or uriniferous tubules. There are approximately 1.25 to 1.5 million nephrons in one kidney. A cup shaped body called Malpighian corpuscle or Renal corpuscle. A tubular part called renal tubule. The cortex has a dotted appearance because of the presence of these Malpighian corpuscle. 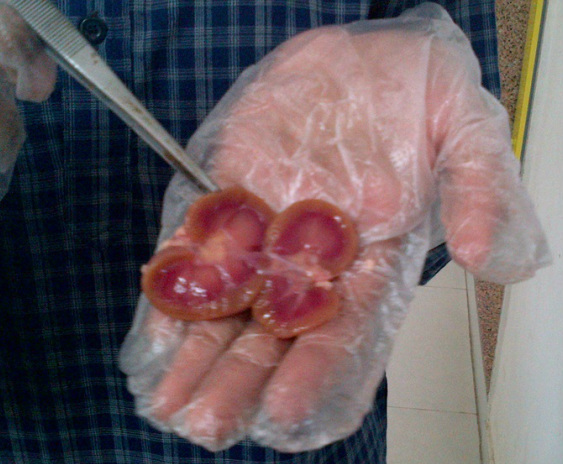 The striated appearance of the medulla is due to the renal tubule. 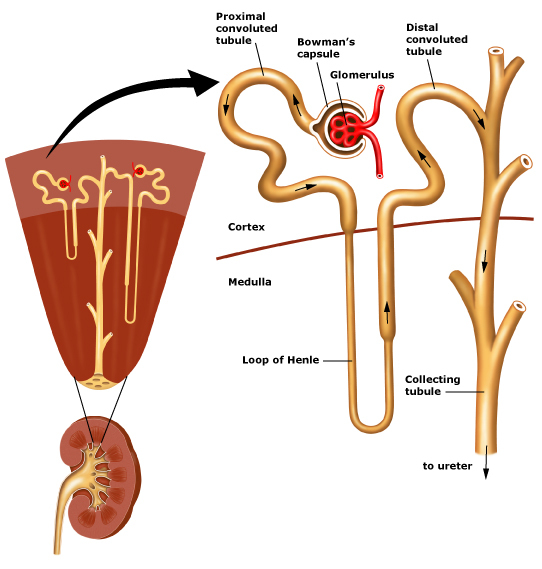 Nephrons that are present in the cortex region are called cortical nephrons, and the ones that extend to the medulla are called juxta medullary nephrons. 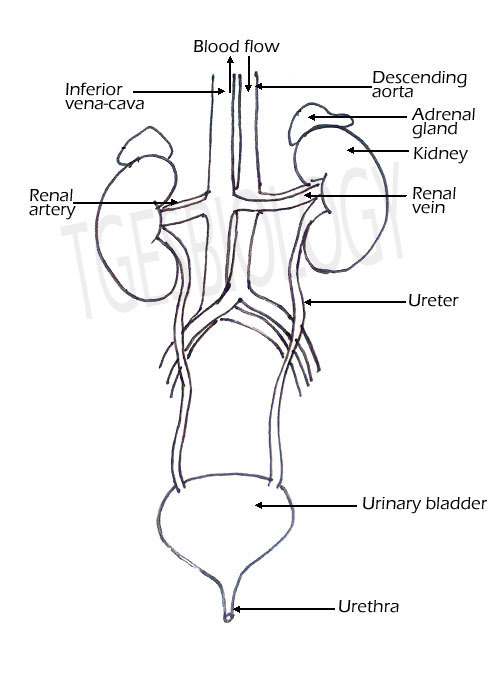 Branches of the renal artery within the kidney produce afferent arterioles. 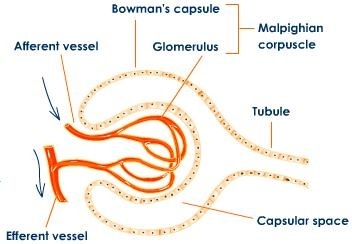 Each afferent arteriole leads to a network of capillaries called a glomerulus. Blood leaves the capillaries of the glomerulus via an efferent arteriole and enters capillaries in the medulla called peritubular capillaries, which collect much of the water that was lost through the glomerulus. Venules from the peritubular capillaries lead to the renal vein, which exits the kidney and returns blood to the inferior vena cava. 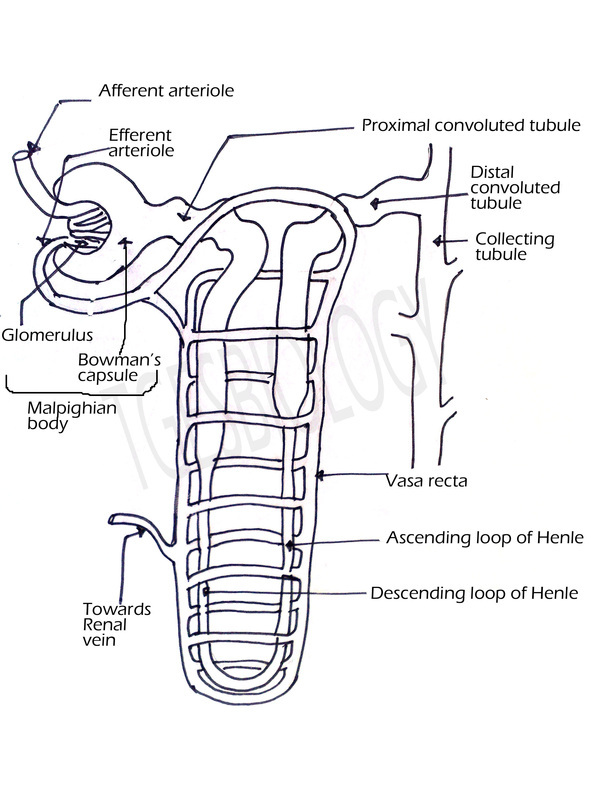 The tubular part of the nephron is called as renal tubule. It has three parts- Proximal convoluted tubule, Loop of Henle and distal convoluted tubule. The proximal part of the renal tubule is highly coiled and is present in the renal cortex. This part absorbs water and all the useful salts, amino acids and glucose. The proximal part extends downwards to form a narrow tubular part- the descending part, a loop and an ascending part. This lies in the medulla and mainly absorbs water from the nephric filtrate. The ascending limb leads to a convoluted part the which also lies in the cortex. This opens into the collecting tubule. This part excretes some ions and ammonia into the filtrate. 10-12 inches length, half an inch diameter. Enters the bladder through oblique tunnels that function as valves. Carries urine from kidney to the urinary bladder. Pear shaped highly distensible sac-like reservoir, store urine temporarily. Opening to the urethra is guarded by sphincter muscles. Can hold about 0.5 to 1liter of urine. Narrow tube from bladder to the exterior. Female it is 3-4 cm long and males 18- 20 cm long. 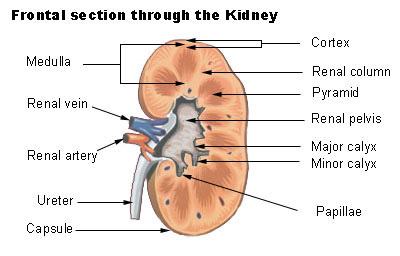 URINE FORMATION TAKES PLACE IN THE KIDNEY. ULTRAFILTRATION.- Filtration under high pressure. Bowman's capsule acts as ultra-filters. When blood flows through glomerular capillaries- all substances (except blood cells and plasma proteins) are filtered. Main reason for ultrafiltration is the difference in the size of afferent and efferent arterioles. The efferent arteriole are narrower than the afferent arteriole. TUBULAR SECRETION.- secretion of harmful substances from the blood into the nephric filtrate by the cells of DCT. Removal of excess of water and salts. 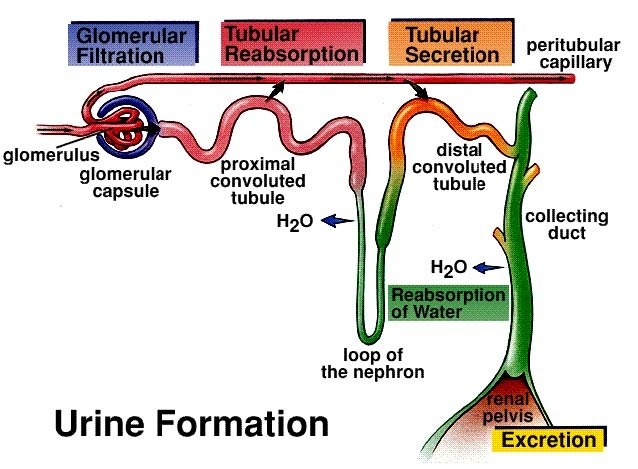 Urine is formed by the combined action of glomerular filtration, tubular re-absorption and tubular secretion. The urine is carried to the urinary bladder and when sufficient amount of urine is accumulated, urine is excreted out of the body. The act of voiding out of urine is called urination or micturation. Transparent pale yellow fluid acidic in nature. Contains- water, mineral salts (NaCl), urea, uric acid, creatine and some excess hormones vitamins etc. 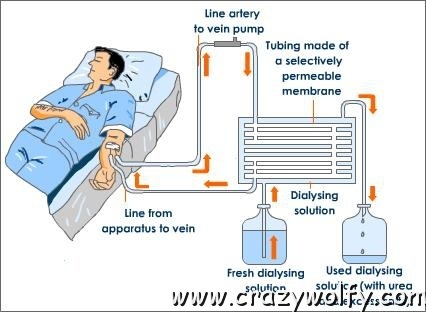 When the kidneys fail to function then the blood of the person is filtered through a dialysis machine or dialyser. It removes excess urea and salts from the blood such that the blood is filtered artificially. It is also called artificial kidney or kidney machine.